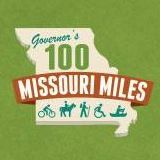 The Missouri Highway Patrol's Statistical Analysis Center compiles official traffic crash statistics for Missouri. They have recently released the data for 2010. 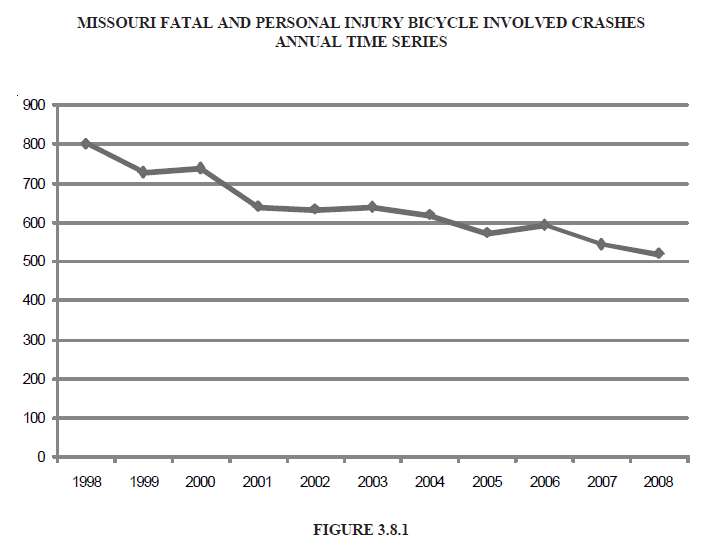 Below is a summary of that data for the years 2000-2010 for bicyclists and pedestrians. 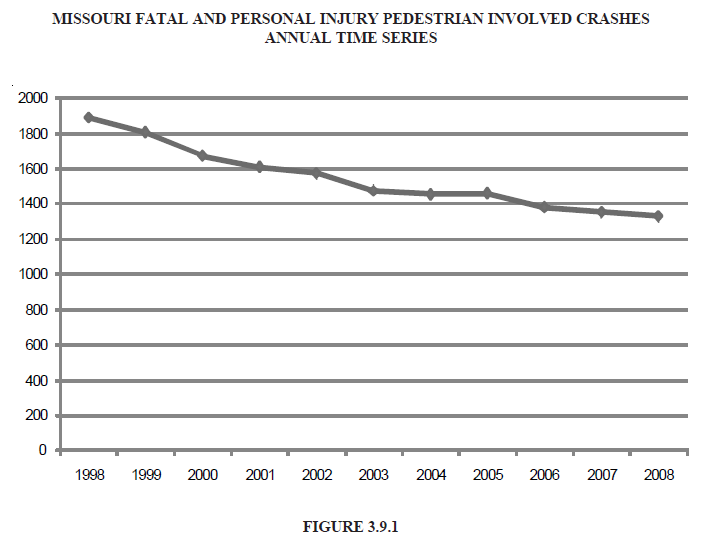 The big story: Even though the number of pedestrian and bicycle trips has grown steadily in Missouri (up by 40-50% since 2000, by our best estimates) the number of fatalities and injuries has shown a steady decline. Note 1: Note that the tables and graphs above each summarize slightly different data--that is why the numbers on the charts and those shown on the graphs don't quite match up. The graphs summarize the number of bicycle or pedestrian involve fatality and personal injury crashes (each crash may involve more than one person injured or killed; some of those injured or killed may be pedestrians or bicyclists, and some may be other people). The tables show the numbers injured/killed AND represent individual bicyclists or pedestrians injured/killed, which is different from the number of crashes. 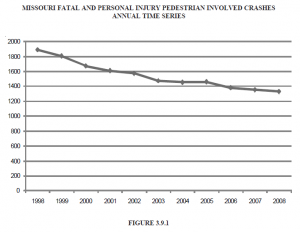 The percentages represent the number of fatality or injury crashes as a percentage of all such crashes in Missouri. The tables also show two additional years of data (2009 and 2010) that is not yet graphed. For details about the different numbers and the meaning of each, see the Missouri Highway Patrol Statistical Analysis Center's web site. 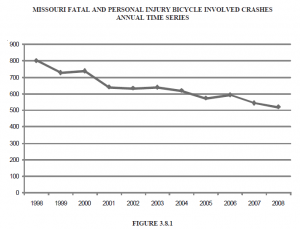 Note 2: This data captures almost all bicycle fatalities, but misses approximately 90% of bicycle injuries. For an explanation of why that is so, read this article. All known bicycle fatalities in the Kansas City area mapped.